Nurek Dam is one of the world’s highest dams with a total height of 984 feet. It is located on the Vakhsh River in Khatlon, Tajikistan. It is a large earth fill dam. Construction of the dam started in 1961 and was completed in 1980. This dam was constructed by the old Soviet Union, at that time Tajikistan was still a republic within the Soviet Union. This reservoir has a capacity of 10.5 square kilometers which makes it the largest in Tajikistan. The Nurek Dam Project is owned by Nurek Hydropower Plant controlled by the Ministry of Energy and Industry of the Republic of Tajikistan. The dam measures 70 kilometers in length and has a surface area of 98 square kilometers. There is a hydroelectric plant located within the dam which gets proper supply from the reservoir. This nine-unit power plant associated with the dam has a design capacity of 2,700 megawatts of electricity. The first of these nine hydroelectric units was commissioned in 1972 and the last unit was commissioned in 1979. At its crest, the Nurek Dam measures 2,309 feet in width. This dam has a central core of cement which forms an impermeable barrier within a 300-meter-high rock and earth filled construction. There is a concrete saddle under this core and it appears to be a core extension. The dam is located in a deep gorge along the Vakhsh River. Declan, Tobin. " 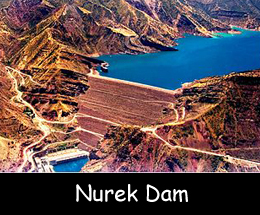 Fun Facts for Kids about Nurek Dam ." Easy Science for Kids, Apr 2019. Web. 21 Apr 2019. < https://easyscienceforkids.com/nurek-dam/ >.